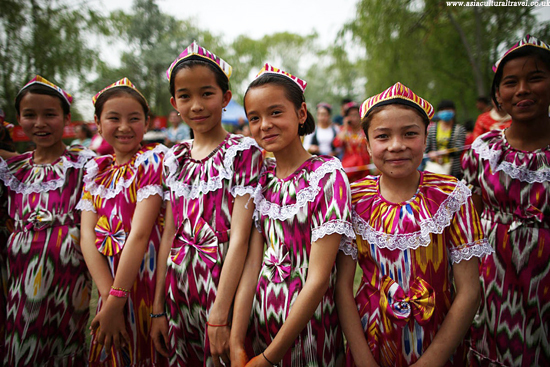 With a population of over 8 million, the Uyghur people are easily one of the largest ethnic minority groups in China. The majority of them reside in the Xinjiang Uyghur Autonomous Region, although there are substantial constituencies of them in Kazakhstan, Kyrgyzstan, Uzbekistan, and Turkey. Smaller communities of Uyghurs can be found throughout the world, even as far as Germany, Australia, and the United States! They live primarily at the base of the Tianshan Mountains, with an estimated 80% of Xinjiang’s Uyghur population occupying territory surrounding the Tarim Basin. Outside of Xinjiang, the largest community of Uyghurs in China can be found in Taoyuan County of Hunan province. When it comes to religion, they predominantly follow the Sunni branch of Islam and subscribe to the mystical Islamic tradition of Sufism, although they tend to distance themselves from other Muslim groups in China, such as the Hui people. Compared to China’s other ethnic minorities, the Uyghurs are profoundly physically diverse, ranging from people who look ethnically European or Middle Eastern to those who have a far more East Asian appearance. This physical diversity points to a difficulty in defining exactly what makes someone a member of the Uyghur ethnic group. In the Turkic Uyghur language, the word “Uyghur” literally means “united” or “allied”, which is somewhat fitting when you consider that the Uyghur group is actually a melting pot made up of a multitude of ancient peoples! The term “Uyghur” was first used during the Northern Wei Dynasty (386–535) in reference to a clan of the Gaoche people, who were a group of Turkic tribes. Later on, the Gaoche became known as the Tiele people. Historically, the Uyghurs were a nomadic tribe who spent much of their time as vassals to larger and more powerful ethnic groups, such as the Mongolians and the Han Chinese. However, that wasn’t to be the case for very long! In 734, the Turkish Khaganate (682–744), which had once ruled much of the area on China’s northern borders, started to fall apart and numerous Turkish subject tribes vied with one another to annex its valuable territory. After a lengthy period of warfare, the Uyghur people emerged victorious and established the Uyghur Khaganate (745-840). At its peak, its territory stretched from the Caspian Sea right through to Manchuria. Yet, rather confusingly, anyone who was a citizen of the Uyghur Khaganate was designated a Uyghur, regardless of their ethnic heritage. It was at this time that the Uyghur people were influenced by Sogdian refugees and converted to Manichaeism. Their situation at one of the crucial stops along the Silk Road meant that trade blossomed in the Uyghur Khaganate, and this trading culture is still evidenced by the many lively markets throughout Xinjiang. Unfortunately, after a brutal famine and a civil war, the empire was overrun by the Kyrgyz people and collapsed in 840. The Uyghur refugees were forced to flee and ended up settling in the area surrounding the Tarim Basin. They established the Kingdom of Qocho (856–1335) and eventually converted to Buddhism. As time went on, they gradually intermarried with the local people and became the Uyghur ethnic group that we know today. Islam arrived into China sometime during the 7th century and was widely spread by the Kara-Khanid Khanate (840–1212), which was a Turkic dynasty that ruled an area in Central Asia known as Transoxiana. By the 17th century, the majority of Uyghurs had finally adopted Islam as their main religion. The region where they lived, which was once known as East Turkistan, didn’t become part of China proper until it was conquered by the Qing Dynasty (1644-1912) in 1864 and renamed Xinjiang or “New Territory”. The small community of Uyghurs that currently live in Hunan province are descended from Uyghur soldiers that were sent to the region during the Ming Dynasty (1368-1644) to help quell a local rebellion. Nowadays, the Uyghurs are well-known for their rich culture and fascinating customs. Throughout Xinjiang, visitors are consistently dazzled by the bright colours of their traditional dress, the sumptuous aroma of freshly grilled kebabs, the beauty of their local mosques, and the sprightly sounds of Uyghur musicians. 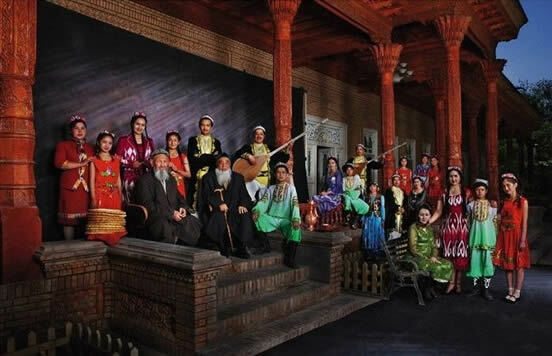 In particular, a type of musical performance known as the 12 Muqams of the Uyghur people was designated by UNESCO as an Intangible Cultural Heritage of Humanity in 2005, proving the impact that these people have had on local culture. In short, a trip to Xinjiang simply wouldn’t be complete without indulging in the opulence of Uyghur culture.